Flag # 1, 2009. Junk mail, acrylic paint, paste, recycled mailing tube and cotton, 46 x 21 x 2 inches, (detail). 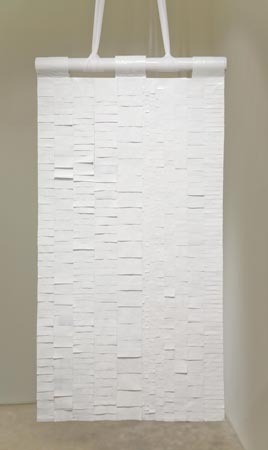 Chime # 1, 2009. 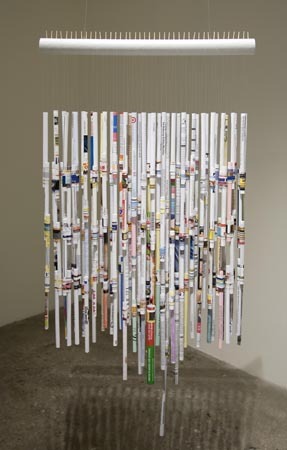 Junk mail, paste, recycled mailing tube, toothpicks and monofilament, 29 x 19 x 2 inches. 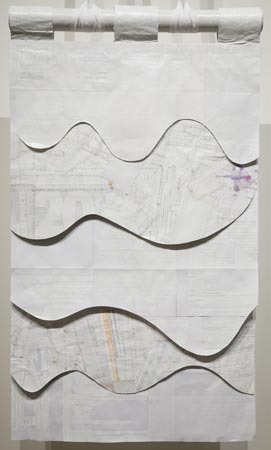 Flag # 2, 2009. Junk mail, acrylic paint, paste, recycled mailing tube and cotton, 42 1/5 x 29 x 2 inches. 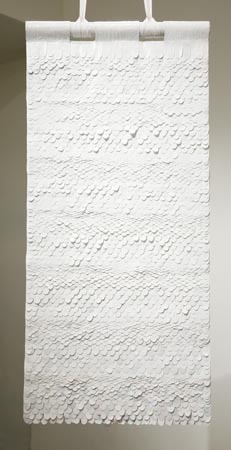 Chime # 2, 2009. 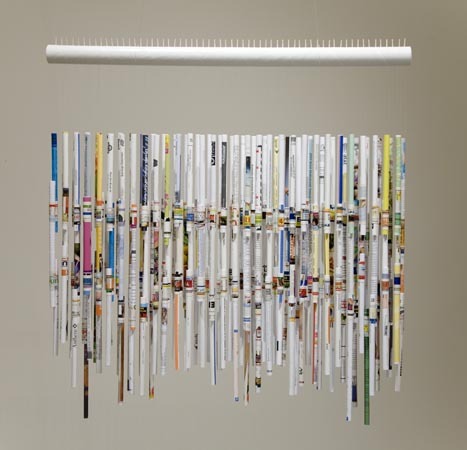 Junk mail, paste, recycled mailing tube, toothpicks and monofilament, 33 1/2 x 31 x 2 inches. Flag # 6, 2009. Junk mail, acrylic paint, paste, recycled mailing tube and cotton, 40 x 22 1/2 x 2 inches. Flag # 4, 2009. Junk mail,acrylic paint, recycled mailing tube and cotton, 33 1/2 x 19 x 2 inches. Flag # 1, 2009. 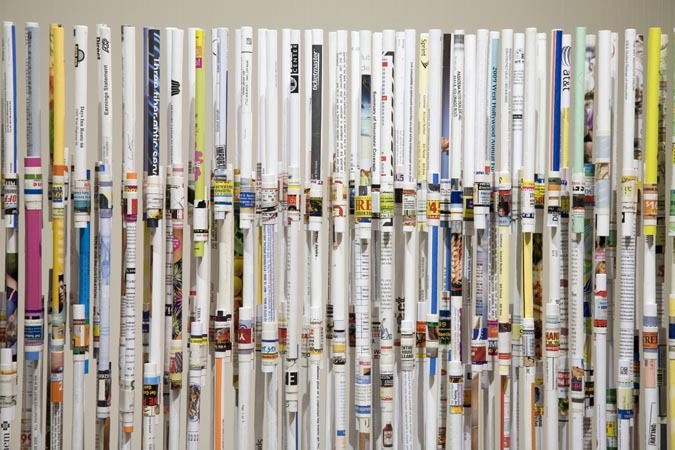 Junk mail, acrylic paint, paste, recycled mailing tube and cotton, 46 x 21 x 2 inches. 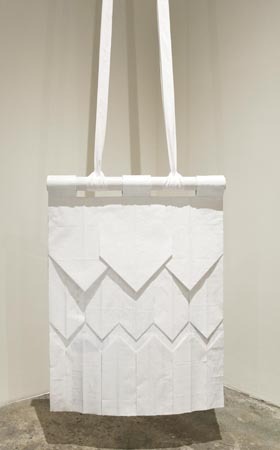 Flag # 3, 2009. Junk mail, acrylic paint, paste, recycled mailing tube and cotton, 53 x 23 x 2 inches. 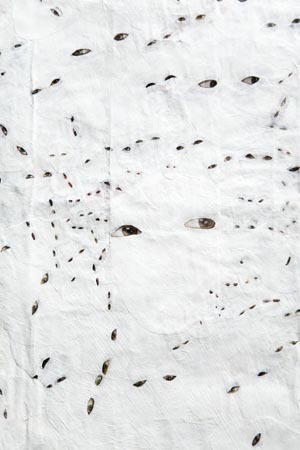 Flag # 5, 2009. Junk mail, acrylic paint, paste, recycled mailing tube and cotton, 44 x 22 1/2 x 2 inches. Flag # 7, 2009. Junk mail, acrylic paint, paste, recycled mailing tube and cotton, 28 x 21 x 2 inches. Flag # 7, 2009. Junk mail, acrylic paint, paste, recycled mailing tube and cotton, 28 x 21 x 2 inches, (detail). 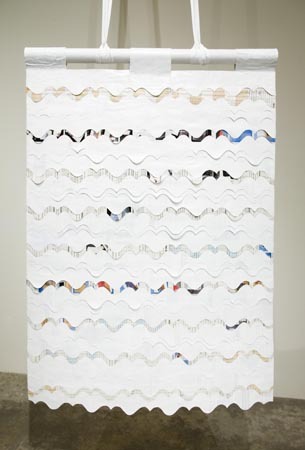 Chime # 3, 2009. 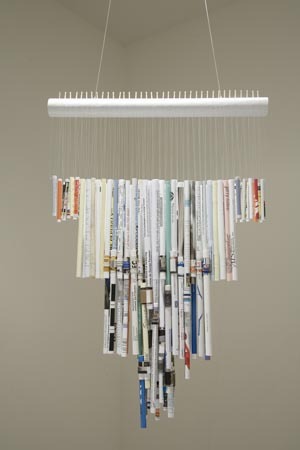 Junk mail, paste, recycled mailing tube, toothpicks and monofilament, 46 x 21 1/2 x 2 inches. Steve Turner Contemporary is pleased to present China Adams: White Flags and Silent Chimes, Adams’ second solo exhibition at the gallery. 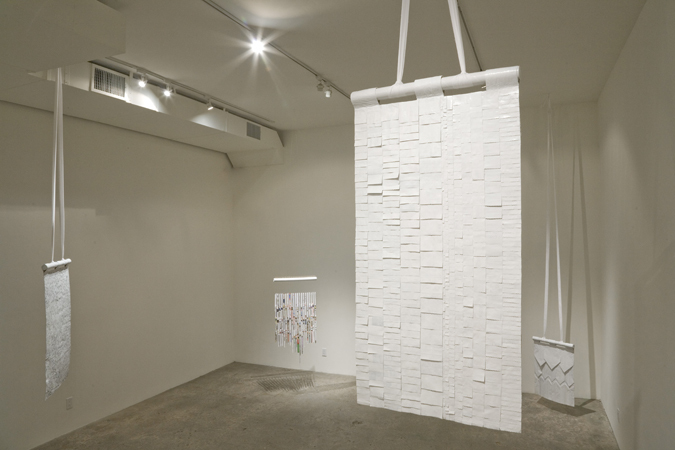 With White Flags and Silent Chimes, China Adams continues to investigate recycled materials by creating art works from the detritus that accumulates at her home, including the junk mail that arrives daily in her mailbox. 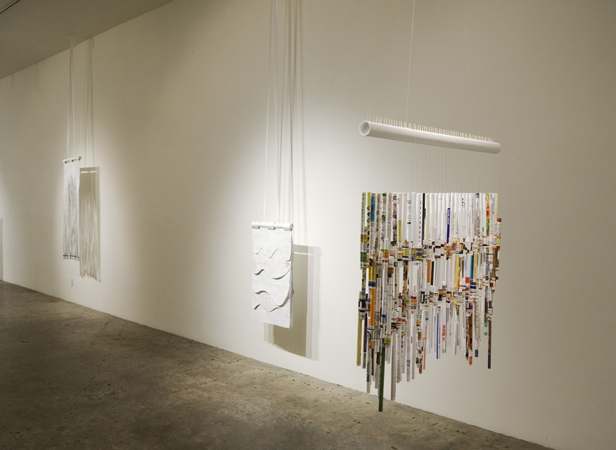 Using such material, which is generally considered “garbage,” Adams transforms the inherent worthless character of the material, while not concealing its origin, into something renewed, re-contextualized and reformed. 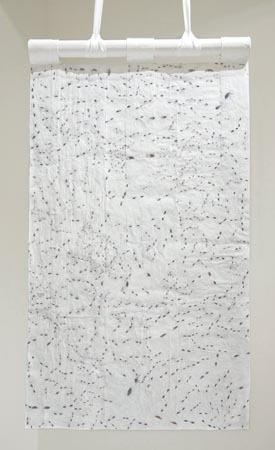 In these works, Adams addresses the systematic production of waste and its perceived ugliness along with the sense of environmental failure that so much waste implies. By transforming these scorned materials into meticulously crafted objects, she constructs an alternative view of the “cast off” as something potentially useful. China Adams earned a BFA from the University of California, Los Angeles in 1995 and an MFA from the University of Nevada, Las Vegas in 2000. 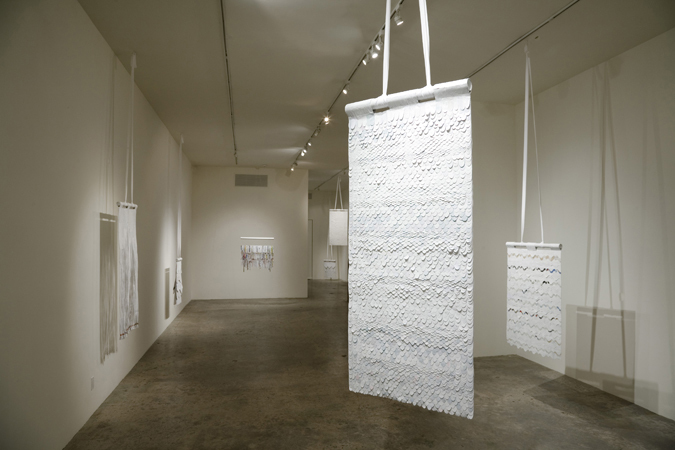 Her work was recently included in Under the Knife at the Armory Center for the Arts, Pasadena (2009). 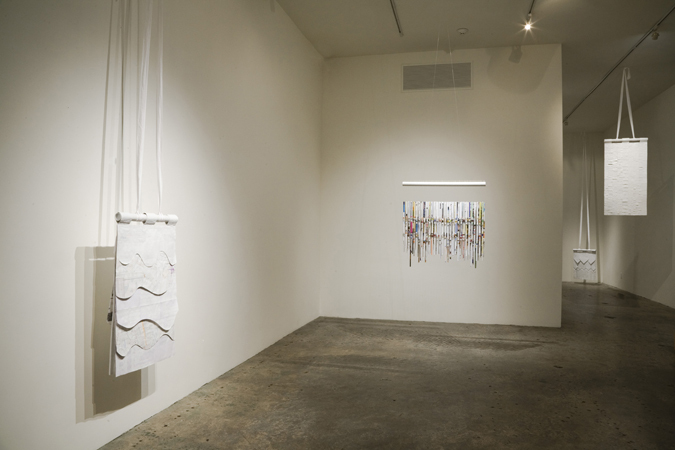 Between 1994 and 2004 Adams had nine solo exhibitions at Ace Gallery, Los Angeles.